We made it out to Magic Kingdom recently to give the all-new hot dog of the month a try at Casey’s Corner. For some time now, Casey’s Corner has been rotating a hot dog of the month on or about the first day of each month. So was the Buffalo Chicken Hot Diggity Dog worth a stop in? Let’s find out. The hot dog of the month usually comes in both the “regular” and the footlong variety. We, of course, ordered the footlong version as well as the accompanying loaded fries. Both the hot dog and the loaded fries come with the same toppings. 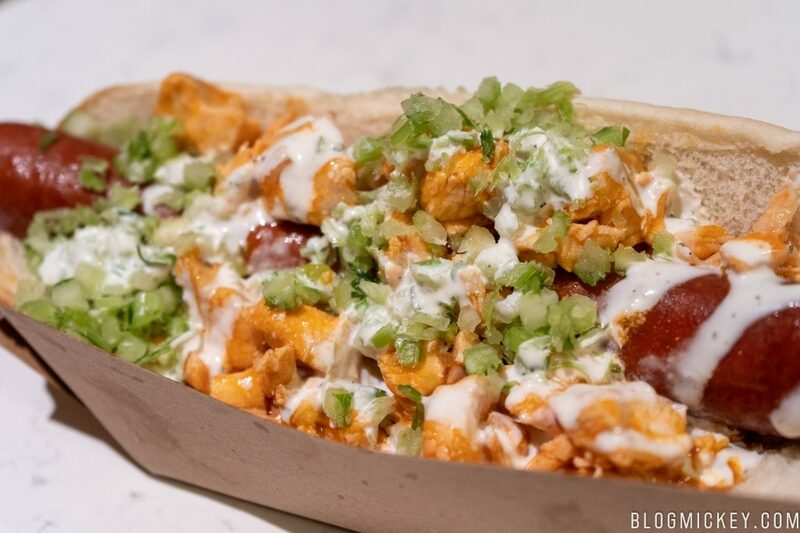 This month, that meant buffalo chicken, diced celery, and a garlic ranch drizzle. Casey’s Corner has a specialized footlong boat to set your hot dog in for easy transport. We actually had to ask for a second one given how much food you really get here. Make sure you grab a fork and knife too, because this isn’t the type of hot dog you can just attack in a handheld fashion. As far as the ingredients go, don’t expect to get a hot or spicy buffalo chicken. This is decidedly mild and it gets even more mild thanks to the garlic ranch drizzle and refreshingly cool diced celery. I think the whole thing was a bit mild and wanted a bit more kick out of it. 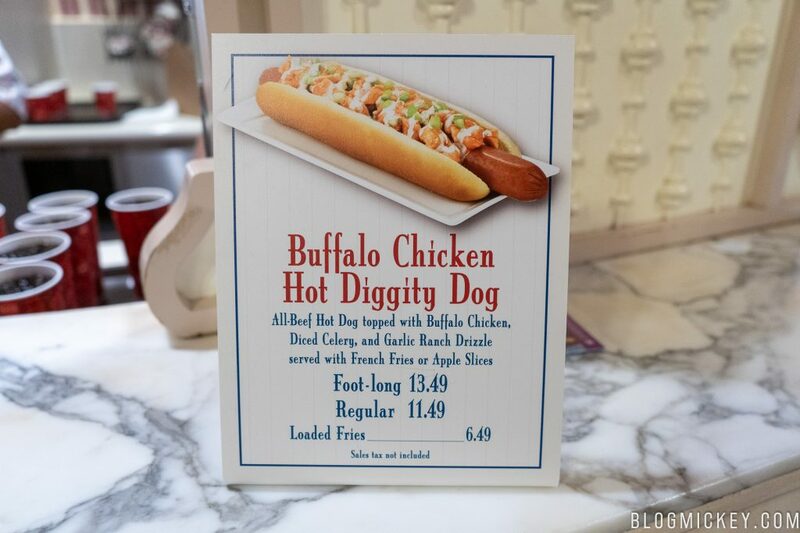 The all-beef hot dog was actually quite good and overshadowed the buffalo chicken when enjoyed together. 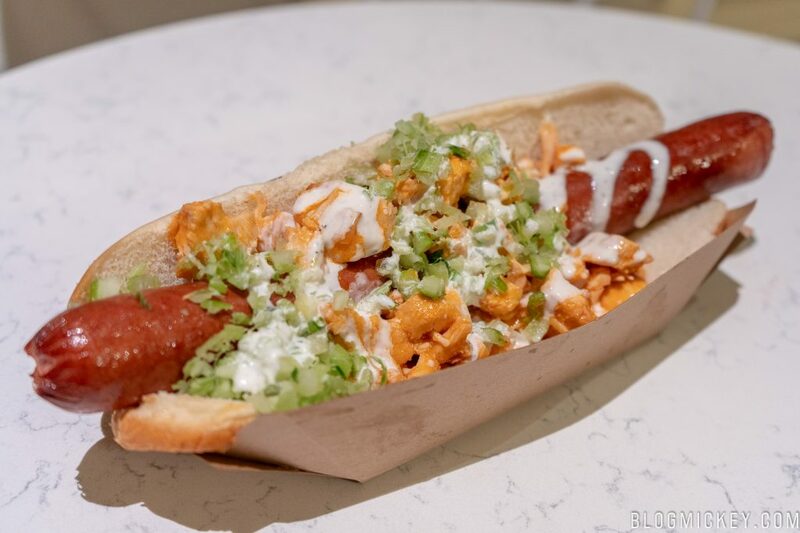 I will say that I preferred the center third of the hot dog where the garlic ranch drizzle and buffalo sauce pooled a bit and soaked into the bun. This is A LOT of food and worth the $13.49 tendered. We can recommend it for your February visit to Magic Kingdom. 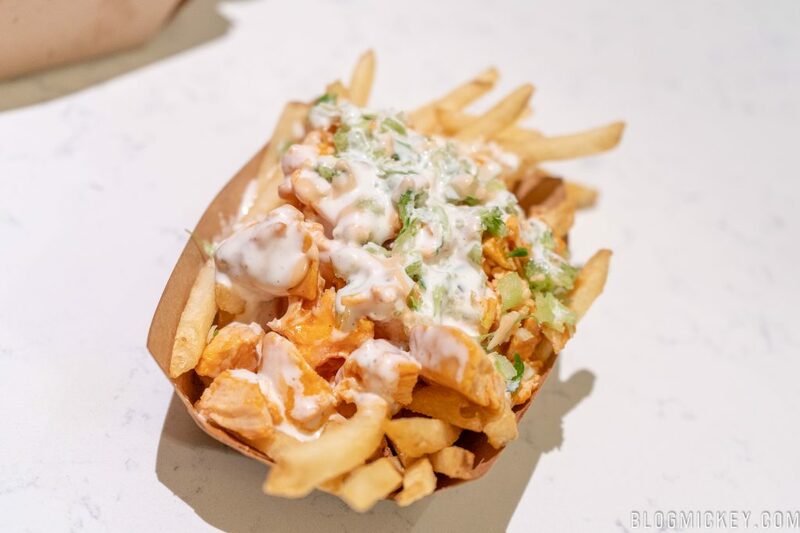 Next up is the buffalo chicken loaded fries. We find the same ingredients here that we did on the hot dog, but they seemed to work better on the fries than they did on the hot dog for some reason. I think with the lack of a competing meat, the chicken works better along with some crunchy fries. The bit of saltiness from the fries also worked a bit better with the existing ingredients. You’re going to want to grab a fork for this one as well, it’s a good portion. If you don’t feel like tackling a footlong hot dog, this is a nice alternative that we can recommend. 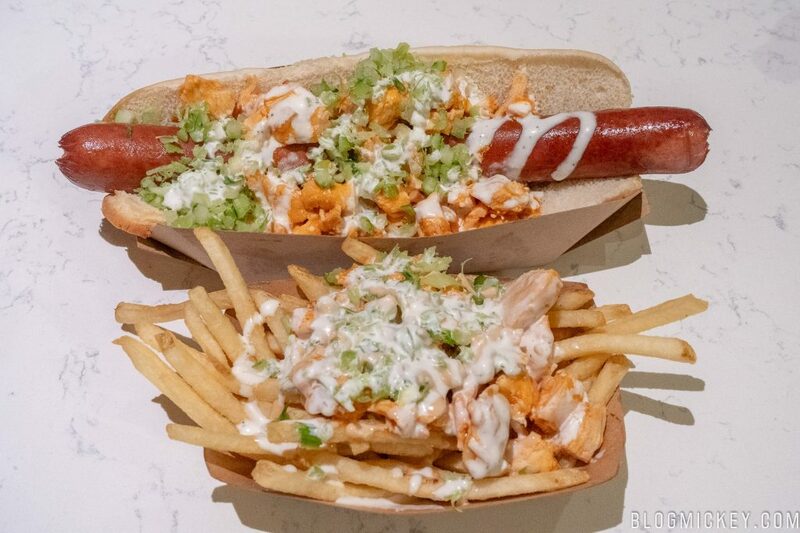 Overall, the buffalo chicken on either the hot diggity dog or the loaded fries isn’t going to overwhelm you with spiciness or heat. It’s a mild take on what could be an outstanding offering. That said, when you’re creating a hot dog on Main Street USA, you have to err to the middle of the road with flavors to appeal more to the masses. This hot dog does just that.